The group gathered in the makeshift campground, nestled alongside California’s Klamath River, was recounting the day’s mining successes. Every night, dinner was as simple as you could make it–not a gourmet feast, but it was plentiful, very tasty and hot. Tonight’s blue plate special, simmering on the propane camp stove, included hamburger served with a boxed potato accompaniment. After a full day of working our 5″ dredge “just add water and heat” took about all the energy we had left. My mining partner, “Bedrock Bill,” and I, had left camp early that day to continue our dredging alongside a promising bedrock outcropping that we had successfully sampled on an earlier occasion. Following a full day’s effort, we had found increasingly good color and were well into the deeper, more densely packed ancient gray streambed material, indicating that this area had not been previously worked. For a couple of tired, hungry miners, dinner also provided a break to take in our surroundings, plan tomorrow’s efforts and converse with our neighbors. The nearest restaurant was miles away and too long a drive. Besides, dinner in this campground was a whole lot more entertaining. Often it became a potluck affair, with others bringing something to add to the selection. A large can of peaches made an appetizing dessert one night for the entire group. How simple and enjoyable life had become! A dirt floor with five-gallon buckets turned upside down for stools and the table, a leftover, well-worn sheet of plywood, were the extent of our dining area. The gas stove and a camp lantern provided the lighting ambiance. Above us was the evening sky, so unusually clear and jet black that you could see thousands of brilliant stars and the vast expanse of the Milky Way. The night we arrived in Happy Camp, I remained awake trying to determine what collection of creatures were responsible for the nocturnal sounds emanating from the surrounding forest. Within a couple of days, I was almost at home in this environment. Every evening, our pleasant dinner conversation was accompanied by the constant rumble of the Klamath River. The wind rustling through the tree-lined hillsides, the hoot of an owl high in the trees, along with a constant melody from the frogs and crickets, were providing the background dining music. 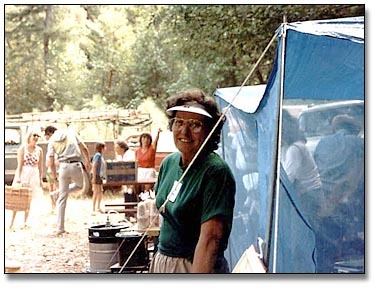 The primitive, virtually spontaneous mining tent city we called home had jokingly been renamed “Camp Liberty” in tribute to the small American flag that was attached to a large oak tree. This place was also home to quite a number of other modern-day gold prospectors temporarily living here in this roadside clearing. Some were from the west coast, and a few had traveled great distances from places all across the country. This place, and others like it, are deep within the Siskiyou Mountains. I would surmise that it is not much different from the mining camps and towns of more than a century ago People arrive and stay for a few days or weeks, and then move on, often to other mining locations. To some, prospecting is a way to spend their vacation-time; and to others, it is their profession and a way of life. Gold prospecting provides the common bond among all of these people and there also exists an attitude of mutual interest in each others’ endeavors. Like a desert oasis to nomadic tribes, nearly every morning, someone departs, replaced by someone new who arrives to take their camping site. All of us were far away from the events of the outside world and no one knew, nor likely cared, what was on the nightly news that evening, It might have been a Monday or maybe a Thursday evening. It was hard to tell and no one really cared. This truly is a good place to lose your sense of time and urgency, to unwind and leave the stresses of life behind. The sun rising and setting is the clock and there is only night and day to signal a change to your routine. There was something quickly noticeable here. Honest, sincere and really friendly people occupied this mining camp. I counted more than two dozen with most like me, from far distant places and differing lifestyles. 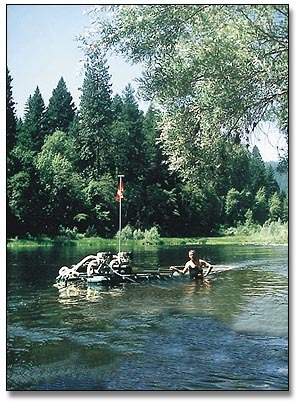 Up and down the Klamath River, separated only by a dozen or so miles, were other camps very much like this place. There were people named Richard and Dan, a couple of Bills, a Chuck and Kitty, Larry and Rosemary, Myrna, Mike, Terry, Jim and Pat, and a few others including a talented fellow nicknamed “McGyver” who could take others discards and make them useful again. Lastly, there were two Daves, including myself. All shared a common interest and pure fate placed us together on a warm summer evening. At day’s end, when returning to the camp, we were welcomed by “Miner Mike.” Once a solitary tree stump in the camp clearing, its two short branches had been decorated by an imaginative person with old gloves and a broken gold pan. Adorned with an old, well-worn straw hat, the facial features were added by creative usage of a camp ax. With a smile on one side and a frown on the other, “Mike” could be turned around to give a graphic assessment of the daily success, or lack of it, to the resident miners in our camp. As for all of these people, I didn’t meet a person who wouldn’t offer help or at the very least, a friendly hello. They are members of an association called “The New 49’ers”, an obvious reference to the California gold rush miners of 1849. For those unfamiliar with The New 49’ers, the organization has collectively acquired ownership to about 60 miles of some of the potentially richest mining claims in the western United States for use by its membership. The New 49’ers is headed up by a fellow named Dave McCracken, who came here several years ago, mined a quantity of gold from the river, started the organization, and added a collection of related businesses. Many of my New 49’er friends have had very good luck on the association claims with hundreds of ounces of gold recovered in recent years. Along the Klamath River and its tributaries, gold is still plentiful in the banks, benches, and streambeds. Many old time miners believe that substantial lode gold deposits remain undiscovered in the surrounding Siskiyou Mountains. On the Klamath and its tributaries, simple panning and sluicing can bring discernible results. You’ll see all sizes and types of floating suction dredges, with their divers working into the often heavy overburden, hoping to find gold. There is a type of mining here for every interest–including motorized sluicing and metal detecting. And it was in this idyllic rustic mountain setting that a few people with common interests had gathered, tired from their day’s efforts, yet exuberant from the gold recovery and relaxed without the more usual cares of life. In this camp, tents and well-worn trailers reside next to “state of the art” high-dollar RV’s with people from all sectors and professions of life. There was a retired accountant from the east coast, a fireman on vacation from Idaho and a doctor from Fresno who gave out free first aid. They joined a retired machinist and a former taxi driver, an elementary school teacher, and a financial consultant, whose partner is a landscape designer. Gold, for which each has come searching, has also become the great social equalizer in this small camp. As with the historic miners of the 1800′, everyone here had come for the same purpose, yet everyone leaves with more than they anticipated, including the wealth of their experiences. The most commonly asked question at the end of the day was “How did ya do today?” Often, the response was “Oh, just a couple of pennyweight,” but two people working a private claim a few miles from here had hit a good paystreak. Their response was that they were doing “pretty darn good,” which later proved to be an understatement. It is a place to leave behind your expectations. If I find a grain of gold or more, it is a bonus. The experiences and associations alone are well worth a fortune. The gold is not only in placer deposits but in the people you meet and the experiences you share and the ability to leave time and worry behind. The main guarantee is that you’ll depart with a renewed spirit and fond memories of your visit. I arose early each morning, a hot cup of coffee in hand, and sat on the rocks watching bald eagles flying away with freshly caught fish clutched in their talons. I caught a glimpse of a mother black bear teaching her two cubs how to fish. Herds of deer and elk often appeared, watching our efforts. A day didn’t go by that I wasn’t amazed and entertained by the vast amount of wildlife I encountered. 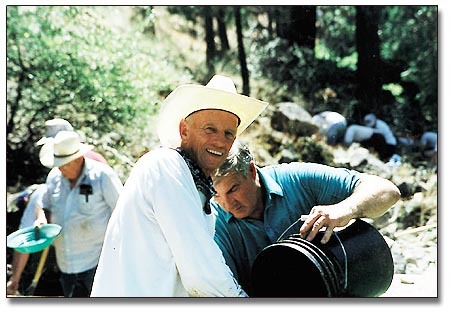 As for our dredging results, we also were quite lucky, recovering a goodly share of the Klamath’s precious gold. The return to the business schedule, the all too frequent trips, the “important” meetings and the urgent decisions could be faced a little more easily. Life, somehow, had regained a proper balance. Yet driving away, I realized that I was already looking forward to a return visit.